Exclusive public debate with Author Andrew Keen and Futurist Gerd Leonhard on October 26. 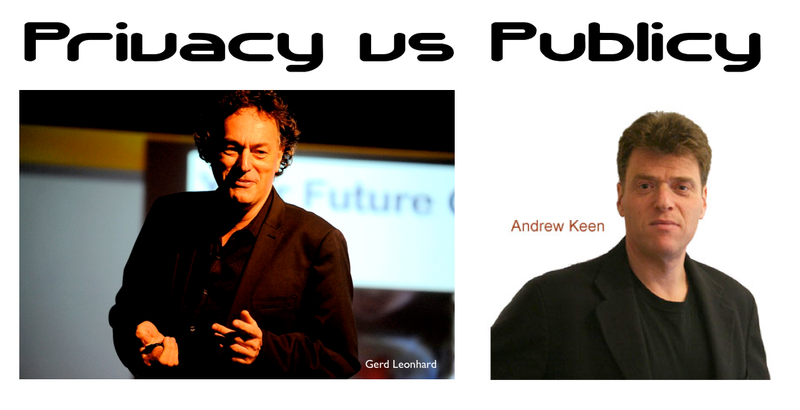 Andrew and Gerd will present some of their key insights for approx. 10-15 minutes each, and will then debate the most crucial issues such as what privacy means in a connected world, whether 'the crowds' are actually being empowered or not, what the future role of social media will be, what the true meaning of a networked society is, and what the media landscape will look like, in the future...more. Get ready for some serious sparring - which will also involve the participants, both via messages and chat as well as via audio intervention (upon invitation only). This seminar will be recorded and is limited to 100 logged-on participants. Register here soon.